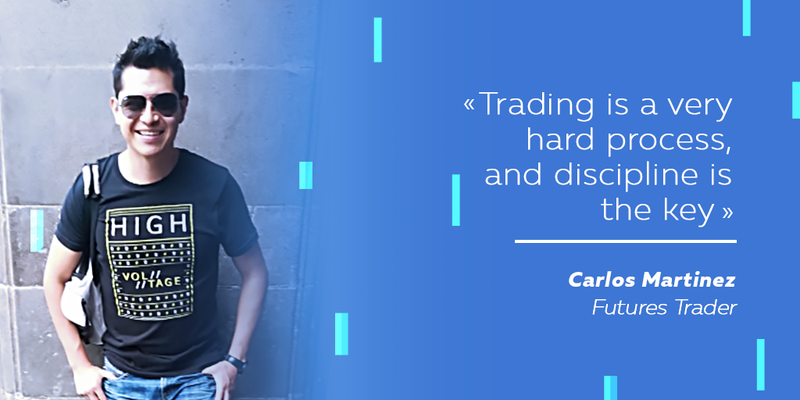 Meet our new hero — futures trader Carlos Martinez from Mexico City. Carlos found himself comfortable to trade futures and he’s excited to be in a prop shop and gain more experience there. Yet, Carlos has some pieces of advice for our readers who use order flow and look for liquidity. How did you start trading? What was your motivation? Well, I started as a wealth management banker in the first commercial bank in Mexico City. After that, my priority was always trading derivatives. In the bank, it is very difficult to do that, so I quit because working for the bank was not my desire. I started trading at the futures market, and I opened my first account with Ninja Trader broker. That’s when I realized I did not know trading was so hard. However, now I’m trading based on my trading line, my strategy, and consistency is my goal. Every day I trade NQ, ES, RTY (NASDAQ 100, S&P 500, and Russell 2000 e-mini futures respectively), equities, and maybe something around $500-$1000 is my profit target per day. As for my motivation, it was financial independence. I wanted to travel, to enjoy time with my family, to take holidays, etc. How long is your trading experience? I started trading futures in 2013, 5 years back. Do you consider yourself successful already, or are you still far away from the goals you have set for yourself? I consider myself a successful trader by today. It’s a very hard process, and discipline is a key. I always look for correlations and trends in the markets. NQ sometimes shows an uptrend. However, RTY and ES don’t do it so much. So I am looking at a divergence in these markets and I trade such opportunities. Ok great. Do you have mane colleagues? Mexican traders? I trade with two colleagues because we share the strategy, but in Mexico City, we have a community. So, what do people do there? Do they exchange tips on what to trade? Yes, we share tips, strategies, books, may be indicators. Overall, I think trading is a process that depends on every trader. For example, I’m in front of the computer from 8 AM till 6-7 PM. I like to read, I like to watch videos, I like the trade meetings of Bookmap, always looking for more information, more knowledge. I guess, you mean the self-discipline when it comes to a community of 50 people, for example. Right? Yes, exactly. For example, in some trading groups on Facebook I share every trade that I take, but not all participants are active. Mexican traders are good, but not good enough to reach an incredible profit. Can you share some success stories, or maybe an overall success path in terms of trading? Sure. For example, I’d used pro software like TradingView. For trading news, I developed an algorithm to trade on Blooming Trade, Bloom Exchange, so on my Twitter account, some trades are viral. What were your biggest win and your biggest loss? Why did they happen? My biggest win was in retail sales. 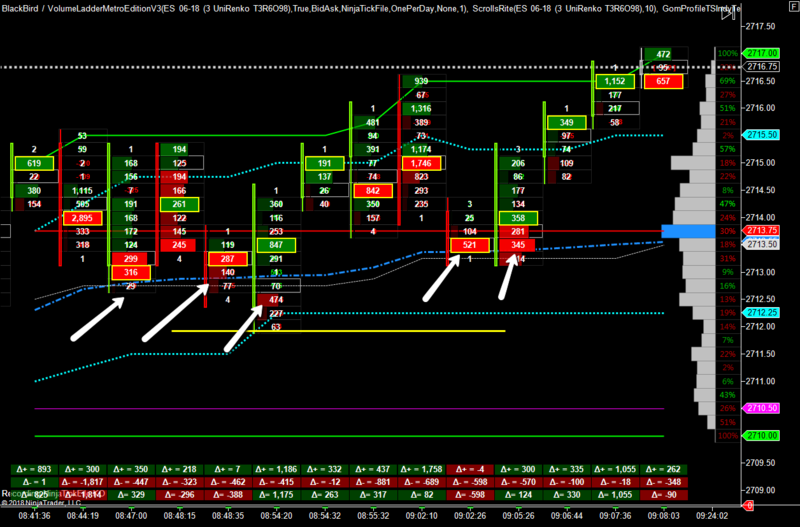 I traded 6J (Japanese Yen Futures), and I went with 5 contracts $250 profit per one. I liked this trade because it was a 5 seconds profit, very fast, and very good data. Good data because of the software you used, or because you can navigate various information fast? It’s a combination of both. It’s the impact of the data and the participants that can navigate information very fast, and it’s obviously the software. I entered with a stop order, the order was filled at a low level, and I reached my early and late targets, which was very profitable. Could you explain what it looks like to have an early profit target and later profit target? Sure. I trade a minimum of two contracts. For example, there are 7 or 4 contracts as the early target, and 3 contracts as the later profit target. The first target, a stop loss, is 15 ticks, and a profit target of 20 ticks, so the second target is 30 ticks and the profit target at least 30 ticks. Ultimately, the first early target is the same for locking a profit, so in case the market goes against the trade, you don’t have to lose much. And obviously, as the second target, I always look for key prices or key areas. What about your daily trading routine? How many days per week do you trade? How many hours? What time of the day? I start at 8 AM, that’s 3 minutes before the market opens. I trade mainly US equities. I am always looking for liquidity. I trade until the market is closed. Usually, I finish my day at 11 AM, but I may be active later too. If you are at home, and you realize there is an opportunity to participate in another trade and make a profit, you jump in again, right? Yes, that is exactly how I do it. Do you stay around your computer for the whole day, or do you go take a walk, and when you come back and there is a good trade, then you can join? Well, I might be in front of my PC, but I’m not so active as at the beginning of the session, because I can be already tired and the very profitable part of the session is the early session. Could you tell what you like about Order Flow? I guess it’s the main strategy you apply to trade futures. Yes. Well, I like to see the stripping which is the combination of all traders and all orders that move the market. The first component is absorption and the second is aggressive buying which is able to move the market. I like that very much. I think both components are very important because if you are looking for absorption only, you do not see stripping or aggressive orders trading, and that is not enough for me. And then, if that is not enough for you, you don’t participate? Overall, if I don’t see this, I don’t trade. Another thing that I like to see is liquidity, but the question is, “Is this liquidity real or is it a spoofing?”. To understand that, you need to see what the market direction is, and if the liquidity is within the market direction, maybe that’s the real liquidity. What are the tips you would give to new futures traders? A tip that I want to share with you is to pay attention to trapped traders. They always buy at very high and always sell at the very low [levels]. Could you please tell what a trapped trader is? Ok. A trapped trader is a trader who is against the market direction. For example, if you buy at the very low, you obviously need a trader who sells at the very low. Therefore, you look for those traders, because you wanna be the counterpart. Have you ever tried high-frequency trading? What are your thoughts on it? I would like to try it, but I do not have enough skills for it now. Sure. It comes with time. For some people, it takes 20-25 years of experience doing something. Do you plan to stay in trading for that long? Yes, sure! For the lifetime, hopefully. Great! But do you have a particular amount of money that would make you stop doing it? No, I don’t. I want to trade for as many years as I can. I want to share my strategies, or my newest algo, for example, but not for everyone. Do you think traders can make the world a better place? I think it’s possible in the future, but I don’t really see it in the short run. You are now trading with two colleagues. Do you just exchange tips online, or you trade in the same room? We trade in the same room, even the same desk. Nice! Sounds like a little firm. Right! Because, for example, I might miss something that my colleagues would see. That is why I think teamwork is more profitable. We just spoke with him recently, and he was talking about his prop shop, and I was wondering if you consider joining any prop shop yourself, or if you lean towards staying an independent trader. I’m actually working with Helios, a prop trade firm. However, in Latin America, prop shops are not very known, and people do not know that it’s a good opportunity to increase leverage, to increase profits, and to discover strategies. Overall, I want to know that traders are actually interested in trading, not just focusing on money, and I want to share my experience. What is the idea behind sharing it? Did you ever have a mentor in trading? Yes, I did. That is why I’m now able to share my approach, which I really enjoy. What is your approach to risk management? What sums of money are you comfortable to trade with during one trade? I think the best risk management strategy you can use is to be patient and trade in synchrony with the market context because you are trading at key prices. That’s the first part of risk management. Another one is to have targets. The first target is to lock profits. Then you should also look for a micro-target. You have to think like a swing trader and adjust your stops to risk less. Have you ever panicked in your trading experience? If yes, how did you deal with it? That’s a common thinking in the futures market. Basically, you just always have to trade with stops. I trade until I reach my profit target, and I stop. It’s about safety. Moreover, leverage is a key, as it allows you to increase your profit. Have you faced any funny situation in trading? Sure. For example, you are analyzing the market, looking for the correlation, but the market suddenly steps you out. It goes against your position, but when you stop, it turns in your favor. It’s known as tick low, or even tick high. It is funny to me because you are right, but the market steps you out. Thank you, Carlos, for our conversation.